Looking for a new puzzle app to offer your students? Cutie Mini Monster App, geared to children under 5 years has gone free (regularly 2.99). An inset puzzle app with an interactive counting book for numbers 1-10 offers basic number identification and puzzle assembly with 2 to 6 puzzle pieces. The app visually is appealing and offers a cute child-like voice when it reads or responses with interaction. Assembling puzzles provides correction when puzzle pieces are put in the wrong place by popping back from their original unassembled location, but users can also move from one puzzle screen to another without completing the puzzle. The only option available is the ability to turn sound (background music plays as soon as the app loads) on and off. 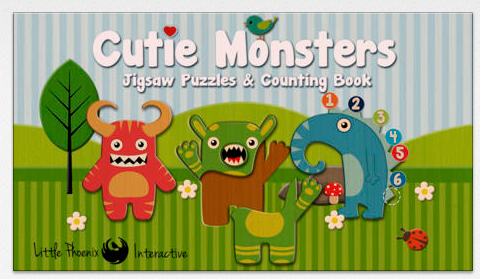 Cutie Mini Monsters is a cute puzzle app with a focus on numbers for young children. It is a worthwhile app for free but has limited content and options for a paid app. Visually appealing and well presented for young learners it may be worth downloading for new, novel puzzle app for kids. More for you OT mTool Kit.